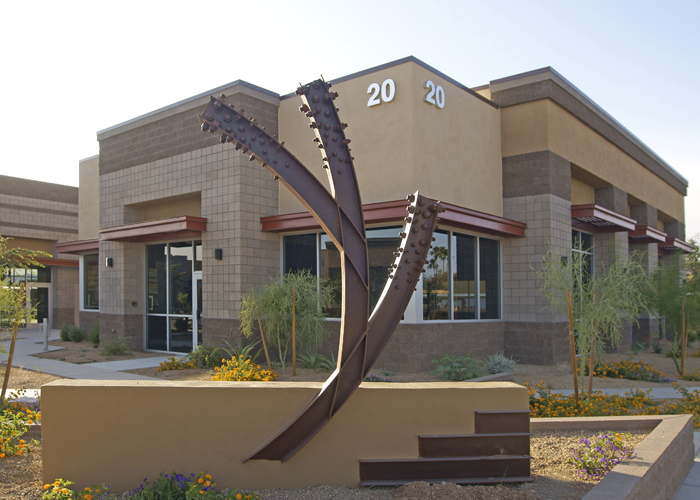 MBJ provided structural services for two commercial warehouse buildings and twelve additional one-story structures at Paloma Kyrene, a 180,000 square foot mixed-use business park, comprising office, medical, flex, and light industrial functions. 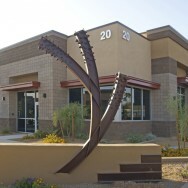 The primary structural system for the two open-space commercial/warehouse buildings is interior structural columns, steel girders, steel joists, and concrete tilt-up wall panels. Both buildings share a depressed loading dock, which handles large truck shipments. Except for a tilt-up separation wall, which helps with lateral stability for the building, interior space is generally wide open to accommodate high stack shelving racks or the addition of a future mezzanine. The other twelve buildings are use load bearing masonry bearing walls with plywood sheathing over structural composite lumber roof framing. Each has a different footprint, making them versatile for any type of tenant to occupy these spaces. Exterior materials for all buildings are storefront glass systems with cantilevered structural canopies over most of the storefront windows.